I just love these guys!!! 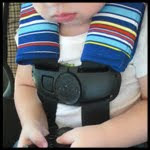 Once again I just used "stuff" I had on hand -- you can certainly replace items in my supply list with whatever you've got! 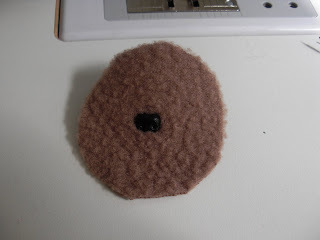 STEP ONE: Fold your brown fleece right sides together, Place pattern on top, and sew around. 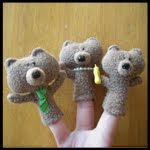 After turning the bears right side out, and before stuffing their heads, I topstitched around the rims of their ears. ...like this. 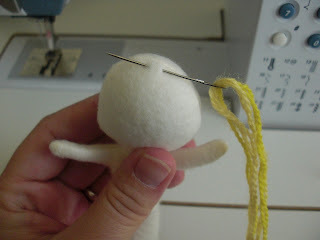 Sew a few stitches starting at the edge of the circle and head up towards the nose. 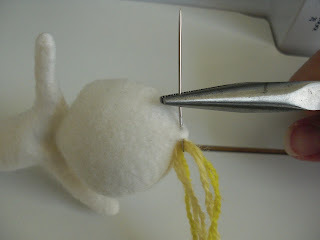 You will pinch a little more of the excess above the nose (I didn't do quite as much as I did below the nose) and continue your stitching to the top edge of the snout. Tie a knot here, but don't cut your thread yet. 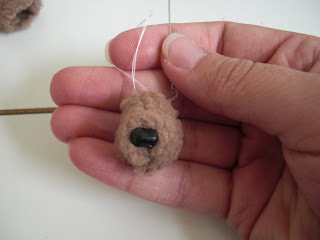 STEP THREE: Attach your bear's snout, starting at the top, and go all the way around. 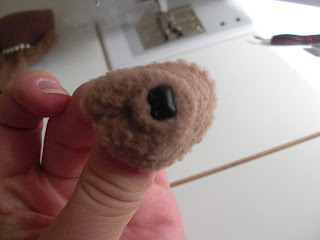 I added the tiniest bit of fiberfil, but mostly the fleece folds inside the snout did the job. 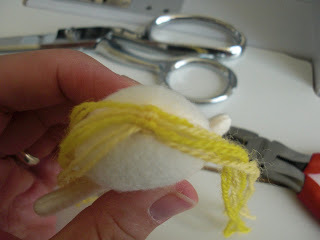 I used the same thread again to attach the seed bead eyes! I used a scrap of diagonally-striped ribbon for Papa Bear's tie, some pearl beads for Mama Bear's necklace, and a Barbie baby bottle for Baby Bear. 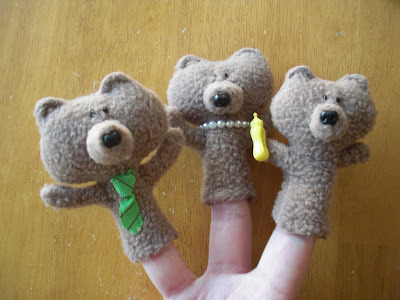 I just love how my bears turned out!! I don't have a full tutorial for Goldilocks, but I did want to show you how I did her hair! 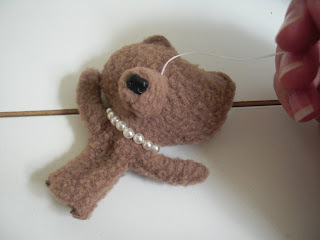 STEP ONE: Sew around Goldilocks the same way you did the bear in Step One. 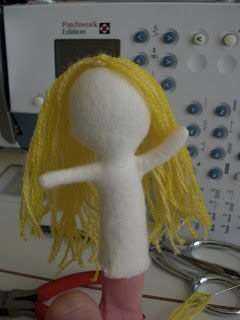 (My Goldilocks is VERY pasty, because all I had was this cream-colored fleece for skin!) 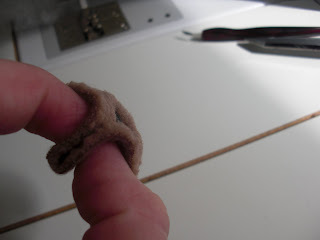 Thread your large needle with a fairly long length of yarn, doubling it down to the end. 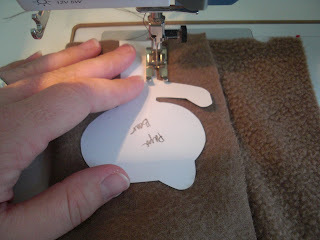 Starting just in front of the seam at the top of her head, poke your needle in as shown. Pull your yarn all the way through until the end is just a bit longer than you want her final hair length to be, and cut the other side to match. 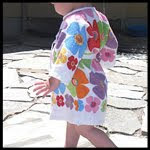 Continue in the same manner down the back of her head until you have as much hair as you like. Her "part" is very conducive to braids or pigtails, but I liked it down -- I just gave her a trim! (After I took this photo, of course.) 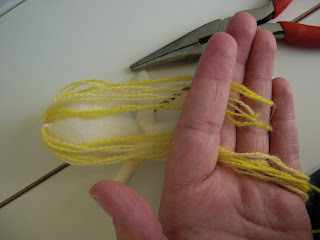 I used a finer yarn, but if you use a heavier one you can separate the twisted strands to make it look more like hair. 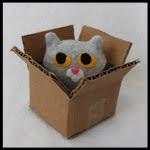 Now she just needs a dress and a face, and perhaps a few props, and you're ready to play! I am having LOTS of trouble deciding how to give a face to this girl... At this point I am ready to leave her faceless!! Any ideas?? 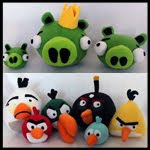 Caroline, these are adorable, so creative. 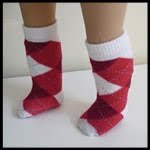 I will be making them for my little Ava! So cute and my little boy has a new found love for Goldilocks and the 3 bears story since I told it to him on a long car ride. He's going to love these!